Having only seen Lynch’s work in Blue Velvet, I was by no means prepared for the type of film that Mulholland Drive was. In contrast to the former, which while certainly featuring Lynchesque weirdness and the recurring theme of the darkness which underlies the veneer of society, but follows a conventional narrative structure; the latter is so disjointed and confusing that it is impossible to understand what is happening until (perhaps) the very end of the film; and even then only if you have an experienced viewer of the film or a guide to the film handy. For those who haven’t seen the film, I can attempt to explain it in terms of other films: Nolan’s Memento follows an achronological narrative (scenes of no more than five minutes, starting at the end and moving backward through time, interspersed with expository flashbacks– in order to reflect the protagonist’s fractured consciousness), Tarantino’s Pulp Fiction consists of six achronological vignettes, not giving the viewer the full picture until the end but still straightforward; and Iñárritu’s 21 Grams consists of a fractured narrative, which, taken together (as the reader’s mind does by the end of the film) forms a non-contradictory whole. 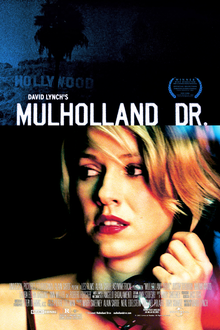 However, Mulholland Drive is a whole different kettle of fish. Without giving too much away (and spoiling the fun! ), the film’s surrealist bent and contradictions puzzle the viewer throughout (I know I was begging for answers!) and even at the end may be interpreted in a myriad of ways. 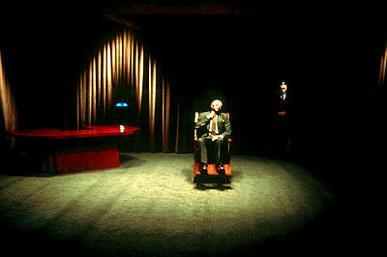 The contradictions cause the viewer to question what is, in fact, real- both in the narrative of the film, and in life (going back to the Lynchian favourite: appearance vs reality). The film is dark and frighening, particularly so for its constrast of the ridiculously sunny, romantized Hollywood dream to the torturous labyrinth of what lies beneath. The use of dreams and illusion both contributes to the appearance/reality dichotomy and the sense of frightening uncertainness: more nightmare than dream. In this way, it is similar to Blue Velvet, but in terms of its complexity, is in a league of its own. As in Blue Velvet, the soundtrack is expertly utilised to manipulate mood and create an aura of mystery. It is difficult to review a film such as this because it is notoriously difficult to explain without giving too much away and ruining the fun. However, I do highly recommend it; although I warn that you must be in the mood for a fairly long film (146 minutes) and that it is essential to watch and pay attention to the entire film, owing to Lynch’s penchant for detail. Keep in mind that you will be confused throughout the film and even after; however, there are interesting websites that provide various explanations and interpretations of the film. In my opinion: a masterpiece, possibly the most interesting film I have ever seen. Five stars.